A compact, quiet tool that hits harder than any other type of breaker. Hydraulics are more efficient than electric, pneumatic or gas-powered tools. For Example a 70 pound hydraulic breaker gives you the same hitting power as a 90 pound pneumatic breaker. 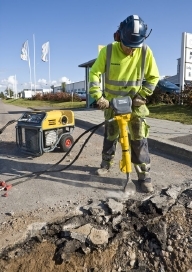 Thanks to their amazing impact energy, hydraulic breakers can be used on concrete, asphalt and frozen ground. You can, of course, also use them for trenching, tie-tamping, spike driving and general demolition. Hydraulic breakers and hydraulic hammers for skid steer, backhoe, wheel loader, or excavators. Including UB Equipment and Rock Tools Models. Also see our lineup of hydraulic compactors. – Impact Rate: 1600 blows/min.